Watchmen is my absolute favorite comic book, so for my first ever strictly comic book convention I knew that I had to cosplay from it to show my love. I love Sally's costume design and it was perfect for a spring convention. 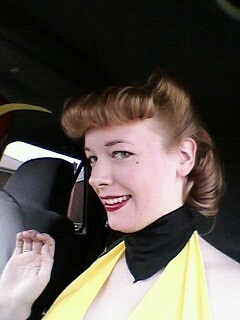 Dressing up from the 40's was super fun, however the boots were pretty painful. The dress, arm accessories, and neck scarf were made by me. All leg accessories and the waste cincher were bought. I had my hair professionally done. I tried so many times to put victory curls in myself but it failed miserably :p. Its super difficult but everyone online makes it look so easy &gt;<.